Tickets can be purchased at the Fox Theatre and Little Caesars Arena XFINITY box offices and Ticketmaster.com. To charge tickets by phone, call (800) 745-3000. 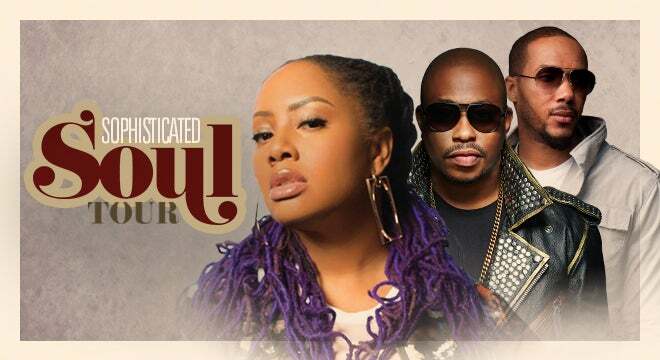 Celebrate the season of love with Lalah Hathaway, the five-time Grammy® Award winner and daughter of the legendary Donny Hathaway, as she brings “The Sophisticated Soul Tour” to the Fox Theatre on Saturday, February 16, 2019 at 8 p.m. The special Valentine’s weekend performance will showcase Hathaway’s irrepressible and boundary-defying voice, complemented by special guests Raheem DeVaughn and Lyfe Jennings, as she performs selections from her eighth studio album, honestly, and many more. Born to Donny Hathaway, one of the most influential soul artists of the eighties, and Eulaulah Hathaway, an accomplished musician in her own right, Lalah Hathaway first put pen to paper, “with the music,” as a 10th grader. Later, as a student at Berklee College of Music, she recorded her self-titled debut in 1990, which spawned the hits “Baby Don’t Cry,” “Heaven Only Knows” and “I’m Coming Back.” The Chicago native returned four years later with A Moment, followed by the much-lauded The Song Lives On, her duet album with Joe Sample in 1999, the same year she began growing her now-signature, cinnamon-hued ‘locs. By 2004, she’d deliver her fourth album, Outrun the Sky, garnering Hathaway her first number one single, the Rex Rideout-produced cover of Luther Vandross’ “Forever, For Always, For Love,” which was also featured on the critically-acclaimed Vandross tribute album of the same name. Although she has created a space for herself, it’s not surprising that Hathaway remains connected to her late, great father and his classic sound. In between album projects, Hathaway - who’s recorded collaborations with Marcus Miller, Meshell Ndegéocello and Mary J. Blige, among them - keeps her creativity nourished by taking to the global stage and contributing her voice to Daughters of Soul, a musical mélange founded by comrade, Sandra St. Victor, and featuring Nona Hendryx, Joyce Kennedy as well as Indira and Simone, daughters of Chaka Khan and Nina Simone, respectively. Lyfe Jennings is a platinum-selling American R&B and soul singer-songwriter, record producer, and instrumentalist. He plays the guitar, bass, and piano, which he integrates into his music. The New York Times referred to him as a “socially minded R&B singer.” Without prefabricated hype, glossy ad campaigns or sexed up videos, Lyfe’s message has become a phenomenon. He offers, “You can talk about something real and relevant and still get some record spins.” Lyfe has cemented that relationship with his live performances; ones that possess you with the spirit to share the lived-in truths learned first-hand from his relationships, betrayal and the streets.